Ant-Man is an upcoming American superhero film based on the Marvel Comics characters of the same name : Scott Lang and Hank Pym. The film is produced by Marvel Studios and distributed by Walt Disney Studios Motion Pictures. It is intended to be the twelfth installment of the Marvel Cinematic Universe (MCU). Peyton Reed is set to direct the film written by Edgar Wright, Joe Cornish and Adam McKay, with Paul Rudd, Michael Douglas, Evangeline Lilly and Corey Stoll starring. 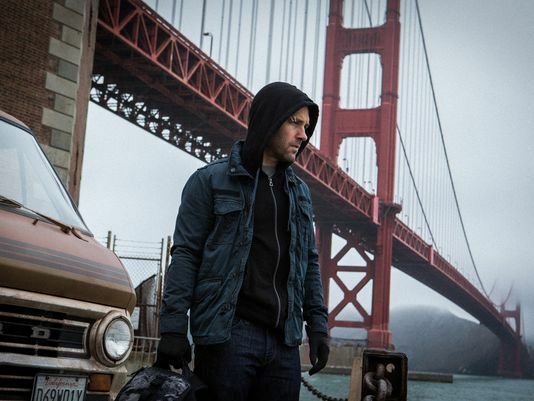 In Ant-Man, Lang must help defend Dr. Pym's Ant-Man technology and plot a heist with worldwide ramifications. I know practically nothing about this guy. Sign me up for all future notifications regarding him! I updated the main post with a link to his Marvel Wiki page, at least the one that will be portrayed in the film. Can't wait for a trailer. Edgar leaving definitely did leave worries for me on this film for awhile but I have faith in Marvel for chosing directors. And I'm not too sure how to feel about the casting to be honest, I enjoy Rudd very much but it might take some getting used to thinking of him as a 'hero'. I only know much about Ant-Man from Avengers: Earth's Mightiest Heroes and the animated films, Ultimate Avengers, Ultimate Avengers 2: Rise of the Black Panther, and Next Avengers: Heroes of Tomorrow. The pic kinda screams "gritty anti-hero" compared to the other films. It's no Frank Castle or Ghost Rider but still. Hey, San Francisco. I know that place like the back of my hand! Never have I been as excited for a film as I am for Ant-Man. Paul Rudd's the only reason I'm still holding out hope for this. Please don't be another Iron Man 2, please don't be another Iron Man 2, please don't be another Iron Man 2, please don't be another Iron Man 2, please don't be another Iron Man 2, please don't be another Iron Man 2. Don't forget Mr. Patrick Wilson. Can anything be as bad as Iron Man 2..? I rather enjoyed Iron Man 2. I mean it's not as good as the other two films, or the rest of the movies in the MCU, but I still found it to be enjoyable. Aside from Justin Hammer. And the slow pacing of the first hour. I adore Sam Rockwell, haha. His part wasn't great but I can't hate the guy in anything he does. The movie unfortunately does suffer from a lot of problems that probably could have been avoided by just giving the movie a bit more love and care. Hopefully Ant-Man doesn't get the same treatment after all of this director drama. Sam Rockwell is a wonderful actor. Anything he does is instantly great. Or at least, durable if it's a horrible movie in other aspects. Iron Man 2 is the red headed step child of the MCU, and the amount of studio interference in that movie is the reason why John Favreau opted not to do Iron Man 3. The only other instance of a director not agreeing with the producers to the point of walking away from the director's chair is Ant Man, which is why I'm worried. Also, loving that anti-hero thing going on in that pic. RIGHT? He has a very unique charm to him. The entire situation is pretty worrisome and it's frustrating because I feel like Marvel has gotten to a point where they're better than this. I need to see a trailer to be able to form any sort of opinion, though. I did get to see this while in Colorado for a little getaway and man, this is the best film to enjoy bar none except for Avengers 2 and really can't wait to get the Blu-ray of it to really get everything in one sitting due to me being deaf. However, one thing I did like about this was the Sam vs Scott fight scene. That was rather unique, wasn't it?